Are you in need of a personal injury lawyer in Brantford? We at Injury Lawyers of Ontario (ILO) understand how life changing personal injury can be. We are committed to transforming a painful, frustrating, and often emotional process into one of resolution. Whether you have suffered from a slip and fall, a motor vehicle accident, a product liability issue, or a workplace injury, allow the lawyers at ILO to take the burden of responsibility from your shoulders. We consider our clients to be extensions of our family; as such, we make every effort to ensure your comfort, ease, and security throughout the litigation process, whether it is in seeking a fair settlement or bringing your case into the courtroom. ILO will help you navigate through the complicated sea of legal processes and insurance claims so that you receive your rightful compensation with the least amount of frustration possible. In Brantford, ILO works with only the most qualified and experienced personal injury professionals. 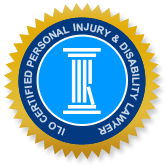 Our expertise in the insurance claim process for personal injuries pertaining to disability claims, car accidents, slips and falls and other areas, often makes the difference between a denied or minimal claim, and a successful settlement. We are confident in our ability to achieve the most favourable outcome for you. Personal injury is often not your fault, particularly when resulting from the carelessness or wrongdoing by another individual or organization. Brantford’s hazardous winter weather and the irresponsible actions of others are but a few examples of circumstances beyond your control that can result in injury to you. One of the most important factors in the potential success of your case is time. The earlier your incident is reported to and handled by a personal injury lawyer, the greater your chances of receiving deserved compensation. If you have suffered a personal injury and are seeking legal representation, we urge you to visit our ILO office, call us, or fill out a confidential online form without delay. If you have sustained an injury that prohibits you from coming into our office in person, please notify us so that we can arrange to bring our services to you.